What is Debtorcare Credit Control? Debtorcare is a credit control and risk management software designed to help credit control departments analyze credit risks, manage clients, get paid faster, and satisfy more customers without doing the heavy work. With Debtorcare Credit Control and risk management, users are able to create credit management processes that are tailored to their customer base. Debtorcare helps businesses set up reminders and notifications that are delivered to their clients at the right moment, encouraging them to settle obligations timely. The software smartly automates routine processes so that users can channel their efforts and resources to other things that matter, enabling them to do and achieve more. Debtorcare automates your credit management processes so you never have to deal with all the complications and technicalities that come with chasing and settling your clients’ obligations and balances. Creating, sending, and following up on invoices mean more administration from your end. Debtorcare streamlines all tasks and processes so you and your credit control team don’t have to spend most of your time doing grunt work. When you run multiple branches and locations, you will realize that one approach doesn’t always fit all. Debtorcare helps you set up credit management processes and workflows that are optimally tailored to your customer base. By having an ideal set up in place, your processes become more seamless and streamlined. 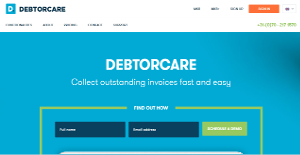 Debtorcare helps you organize your debtor management and accelerate the settlement of your invoices and balances. All from the cloud. You can link the software to your existing accounting and invoicing system without any difficulty. There is no need to acquire and implement a separate custom software, saving you lots of money in the process. Analyzing your customers, their capability to pay, and the financial health of their company can be an intensive process. But with Debtorcare, you get a smart risk management wizard that does all the analyzing by integrating all business information and customer’s payment data. Potential risks are automatically identified and delivered to your attention, allowing you to make intelligent decisions and perform targeted actions. What Problems Will Debtorcare Credit Control Solve? Collecting open invoices is a time-consuming process. Debtorcare address this through automation. You’re not aware of the financial risks you’re being at. Debtorcare analyzes the risks and informs you of their findings and recommendations. Transferring cases to Debt Collection takes time, so these actions are usually postponed. With Debtorcare, transferring clients to Debt Collection is fast and easy, so it will be done faster and more frequently. Since each company has unique business wants, it is sensible for them to abstain from searching for a one-size-fits-all ideal software system. Needless to say, it would be useless to try to find such a platform even among popular software solutions. The intelligent thing to do would be to jot down the various vital aspects that require consideration such as main features, finances, skill levels of staff members, company size etc. Then, you should do your groundwork thoroughly. Read some Debtorcare Credit Control reviews and look into each of the other systems in your shortlist in detail. Such exhaustive homework can make sure you weed out ill-fitting platforms and zero in on the system that presents all the features you require for business success. How Much Does Debtorcare Credit Control Cost? We realize that when you make a decision to buy Accounting Software it’s important not only to see how experts evaluate it in their reviews, but also to find out if the real people and companies that buy it are actually satisfied with the product. That’s why we’ve created our behavior-based Customer Satisfaction Algorithm™ that gathers customer reviews, comments and Debtorcare Credit Control reviews across a wide range of social media sites. The data is then presented in an easy to digest form showing how many people had positive and negative experience with Debtorcare Credit Control. With that information at hand you should be equipped to make an informed buying decision that you won’t regret. What are Debtorcare Credit Control pricing details? What integrations are available for Debtorcare Credit Control? If you need more information about Debtorcare Credit Control or you simply have a question let us know what you need and we’ll forward your request directly to the vendor.